Catch us at The Crepe Place in Santa Cruz on Saturday, September 29. 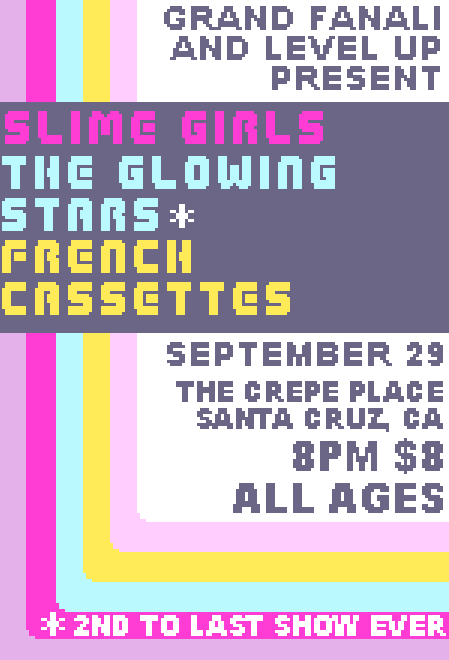 We’ll be playing with Slime Girls and French Cassettes! The show starts at 8PM and is $8 at the door. Don’t forget to get a crepe while you’re there – they’re delicious! Also, if you’re a fan of local “have PA will travel” rockers BATTLEHOOCH, you may have been in for a surprise when their latest in a series of singles came out on September 3rd. They’ve been playing their song “Joke” for a while–even back when we met them at Maker Faire last year–but in the interim they asked Matt to do an 8-bit remix. “Joke 8-bit (Glowing Stars Remix)” is now unleashed to the world, so go check it out here! This entry was posted in Uncategorized and tagged battlehooch, french cassettes, remix, santa cruz, shows, slime girls, the crepe place. Bookmark the permalink.